It’s completely normal for me to wonder aimlessly around Edinburgh on my lunch break, just to stare longingly at the new season French Connection sequin dresses or after pay day, go to Anthropologie and treat myself to that totally overpriced but essential bowl that would look GREAT to pop some, eh, olives in. I stood deep in thought, staring indecisively at the potential purchase in my hand, while clutching onto my champions lunch of a sausage roll and tomato soup combo, obviously. I had a quick flick through the crisp, white pages, wondering if it was a suitable gift for, well, me. ‘One Sentence a Day‘ instantly appealed to me for a few reasons. I love diaries. No, I LOVE diaries. Not just my own, but reading peoples thoughts and memories, seeing people’s faces when they remember something from the past they had possibly once forgotten about. Keeping a short one liner of daily occurrences meant I’d be more inclined to write in it too. It was £10. I only had £13.78 left in my bank before pay day. I can still afford my gingerbread latte on route to work tomorrow. Oh, and they do such cute gift-wrap, right? So, off I walked, out of Oliver Bonas with my new journal and my head held high! I was buzzing from the rush of my purchase! I was swiftly forced to drop my head down towards the tomato soup massacre I had frustratingly just created at the shops door step and all over some poor girls Nikes. UGH. I’ll remember my first entry at least. 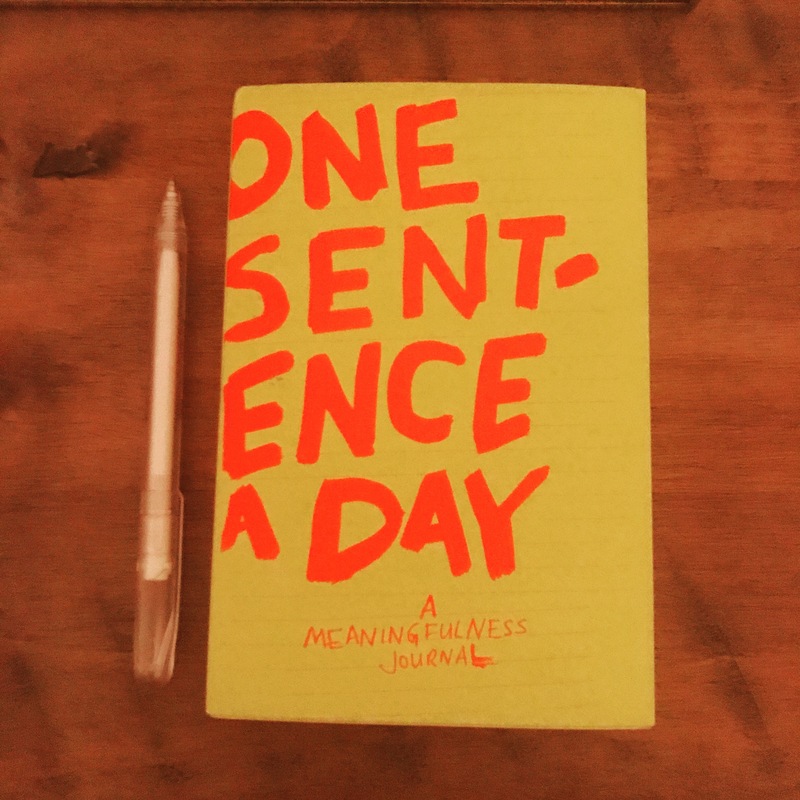 After my face gradually returned to the same colour as my body and not blending in with said tomato soup, I lovingly looked through my new journal. They say its the small moments that you remember, not the year, not the week, not the day, but small moments. Just a few happy seconds can stay engrained in your memory forever, which I think, is darn beautiful. It got me thinking about my ‘stand out’ moments throughout my life. I could essentially be here all day boring you to death with every descriptive detail, but I won’t… I’ll just limit it to a few that may provide some light entertainment. The time I pretended I could snowboard. The time the train loo door opened. On my commute home, roughly 3 years ago, and a bottle of Friday fizz down, I was bursting on the loo after sprinting like Usain to platform 9. No one likes to use a public toilet never mind when it’s going at 80mph! But, desperate times call for desperate measures and all that jazz. I took one big, deep last breath as I entered. You can DO this. I shoved my bag on the hook and quickly started to hover (as I do…) *moment I will remember forever* The darn door swiftly opens as I hadn’t pressed the bloody lock to a crowd of approximately 3 faces looking in, as baffled and embarrassed as I was. I scream. I scramble to shut the door. I DIE inside. That’s perhaps a memory I wish I could forget. The time I watched sunset on Cable beach, Western Australia. I was travelling the West coast of Australia in 2011. I remember vividly, sitting down on a rock, with my 5 seeds cider clasped tightly in hand (it was my favourite!) and witnessing the most beautiful sunset I have ever seen in my entire life. The sky was ablaze with vivid tones of pink, orange and shades of red. There was next to no one there, I had my feet buried deep in the sand and nothing but a rug sack on my back. After a few standard cartwheels, I remember having a moment of complete and utter happiness. I had never felt so free, so alive… so skint! I’ve since made a solid dent in my diary with my one-liner entries. Picking the most meaningful moment or thing that happened to me that day could range from coming home to a hug and the person I love after a really tough day to finally mastering the perfect poached egg (it takes a lot of patience and love!) It could be smiling to a stranger in a coffee shop or being alone with nothing but a good book, spoon and a jar of Nutella. Choose to live in the small moments, because those are the ones we look back on, not the weeks or days. 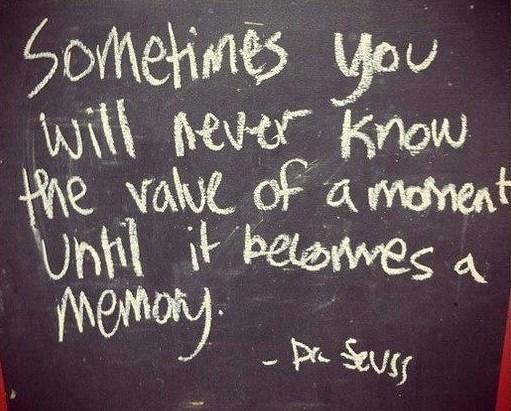 Choose to create the moments, the ones you won’t realise you were in until time passes. If you are lucky enough, you’ll make thousands of them in your life time. The big ones, the small ones, the life changing ones… the one’s that you didn’t realise were important until you do. So, I encourage you to write. Write about all the good, hopefully not too much of the bad, the indifferent, the great. The memories, the moments, the ones you’ll never forget. Keep them close to your heart… and write them down, even if it is just one sentence a day.